Daniel Barram is an Investment Adviser Representative, a Retirement Income Certified Professional® and the Co-Founder of Retirement Prosperity Group and Prosperity Advisers, LLC. 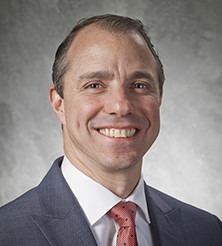 He is responsible for providing investment recommendations to our clients, and manages the firm’s Case Design Team and the Retirement Prosperity Roadmap™ process to ensure that every plan is done with a holistic planning model, tailored to each client and encompassing all aspects of a complete retirement strategy. Daniel has passed the Series 65 securities exam and is also a licensed insurance professional in Pennsylvania. Daniel has spent decades working in financial services, insurance, advertising and marketing, publishing, audiovisual production and human resources. He has spent the last several years in the financial services space as the chief operating officer for a multimillion-dollar firm that helps people with conservative solutions — and saw firsthand how incomplete preparation could jeopardize a client’s financial future. Daniel moved on to co-found Retirement Prosperity Group, which incorporates every facet of planning that retirees and pre-retirees face, from streams of guaranteed income for life, tax-efficiency planning and Social Security maximization strategies to long-term care protection and investments (for those who want to hedge inflation on the market). As a Retirement Income Certified Professional® (RICP) Daniel continues his education and certifications at the American College and Kaplan University. According to the American College "Unlike general financial planning done on the CFP® or ChFC, the RICP® designation delves deeper into the specific area of retirement income planning." In his free time, Daniel enjoys life with his wife, Lisa, and their two young sons. Daniel Barram is an Investment Advisory Representative of Prosperity Advisers, LLC, a Registered Investment Advisor. Insurance and annuities are offered through licensed professionals of Retirement Prosperity Group. Prosperity Advisers and Retirement Prosperity Group are not affiliated entities. Investing involves risk, including the potential loss of principal. Any references to protection benefits, safety, security, lifetime income, etc. generally refer to fixed insurance products, never securities or investment products. Insurance and annuity product guarantees are backed by the financial strength and claims-paying ability of the issuing insurance company.